If you're fit and keen, or pushed for time, the complete Motu Trails loop of 91km can be mountain biked in one day. 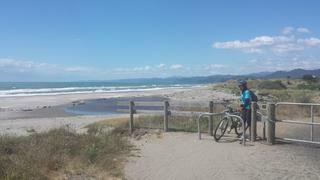 We had a long weekend holidaying in Opotiki to enjoy the summer sun, so not only did we cycle it in two days, but did it in two downhill sections by being shuttled each morning to the top of the Motu Hill. Some may call it cheating, we choose to call it wisdom. Derelict bus on side of road near Takaputahi RoadWe stayed in the bunkrooms at Motu Cycle Trails in St John Street (an excellent choice! ), and each morning at 8.30 we partook of their shared shuttle as it made its long way through the Waioeka Gorge, turning off at Matawai, then up the long slog of the Motu Hill to the Opotiki/Gisborne border. From here it's an easy leafy 8km ride along the quiet clay/gravel road to the shelter and toilet at the junction of the Pakihi Track. Day One we continued straight ahead on the old Motu Road. The road is mainly through the bush, with a couple of sections of farmland in the middle. We were warned to expect 1 or 2 vehicles sharing the road with us - being Waitangi Day there were obviously a few tourists around and it was like a motorway - 6 cars! 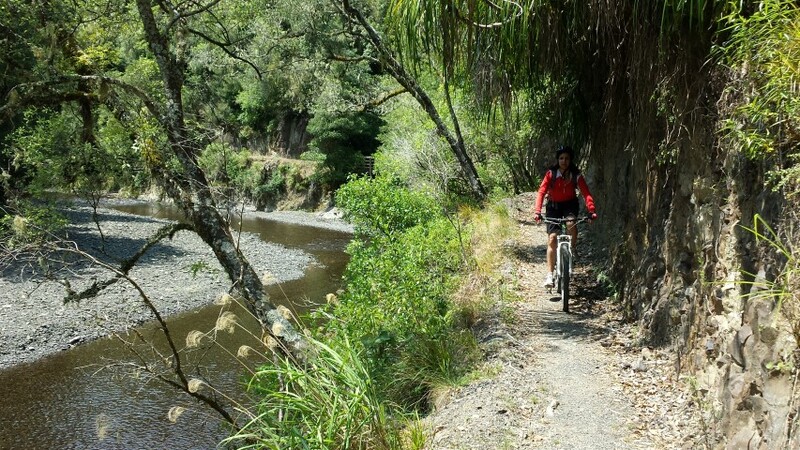 The route is predominantly downhill but of course nothing in New Zealand is ever flat. At the junction of Takaputahi Road (along from the Toatoa Farmstay) is a shelter which made an ideal lunch stop. After the Meremere Hill the road flattens out and follows the river. Before long we were on the tarmac and passing the picturesque Waiaua church. Picturesque Waiaua church A bit further up on the left is a shelter and a footbridge - go over the bridge, pop out on Jackson Road, then cross SH2 to the start of the Dunes Track. We then followed the delightful undulating track behind the dunes for 11km back to the Memorial Park Reserve in Opotiki, stopping repeatedly for photos. In all we completed 54km, on a route graded as Easy. Definitely recommended for those getting into mountain-biking, families, or just anyone wanting to have a cruisy day. Day Two we opted for the Pakihi Track, 21km of downhill single-track from the Motu Road junction. Yes, really! - all downhill or flat. It is rated Grade 4 'Advanced', but the only thing that stops it being rated 'Easy' is that in many places the track is pretty narrow and if you got the collywobbles and wanted to put your foot down, there may not be anything there except a precipitous bush-clad ravine. I admit I walked a fair bit, whereas Pete who's very confident only hopped off his bike for the occasional slip or if he was waiting for me. 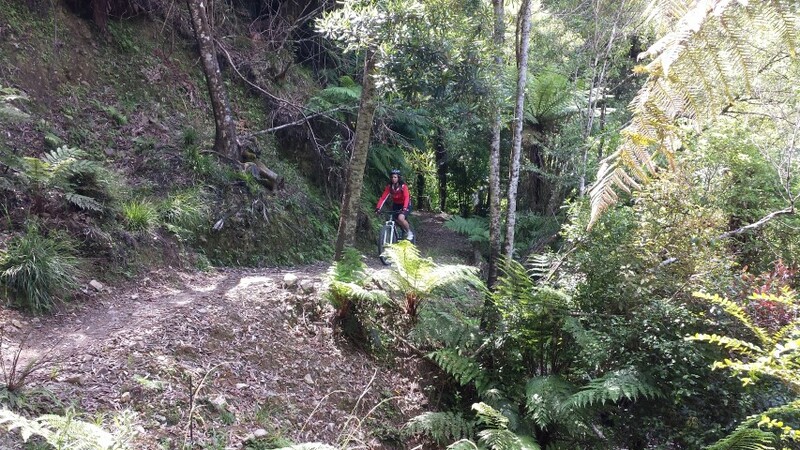 The well-formed track through lush mature forest is shared with walkers who may be walking in either direction, but it is one-way only for cyclists from the Motu Hill end. It is a truly beautiful piece of Nuzild country. Superbly placed for a lunch-break half way through is the Pakihi Hut, a 100m detour off the main track - leave your bike at the top and walk down. The 6-bunk DOC hut with a perspex covered verandah features a couple of picnic tables in a grassy clearing above the river. 1km after the hut cross on the swingbridge to the true left of the river and now it's your right foot that may at times have no air under it instead of your left. The scenery was gorgeous, the river sparkly, but all too soon you have crossed the final footbridge, bridge number 25, and you're spat out at the trail-head. 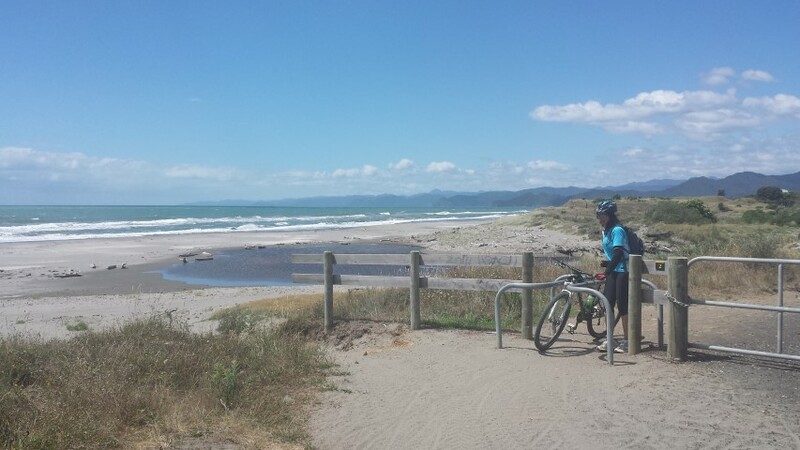 Start pedalling on the gravel road for 9km, and then a further 12km of rural tarmac until you hit the outskirts of Opotiki. 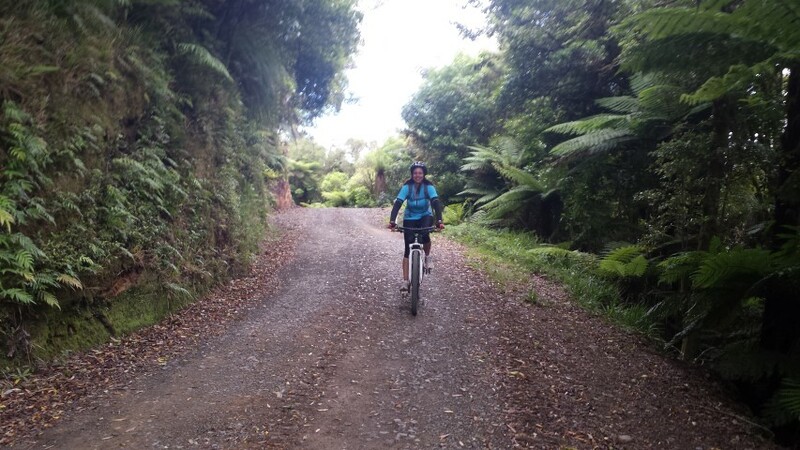 Turn down Te Rere Pa Road and follow the Otara stopbank for the last 4km back to Memorial Park Reserve. We had a head-wind and the road bash section was interminable, so if you can be picked up at the end of the Pakihi Track you would be a fool not to. In all we completed 55km, the first 30km of which was superb. Most riders would be capable of doing it, however the less-confident must be prepared to take it very cautiously and if in doubt get off and push their bikes. A lot. Note from Pete: We can certainly recommend the Motu Trails Bunkhouse/Shutlle and our very hospitable hosts, John & Ngaio.